/ App of the week: Profit and Loss by Big Squid. The Domo Appstore gives you all the tools you need to tailor our platform to the unique circumstances of your business. In our App of the Week series, we’re taking a look at just a few of the 1,000 different applications you can use to hone in on the individual challenges facing your company. Today, we’re highlighting Profit and Loss, a popular app from the independent publisher Big Squid that helps you to get to the bottom of your bottom line. Profit and Loss by Big Squid turns your income statement into an interactive business intelligence tool. Your profit-and-loss statement is the heartbeat of your business. At any given moment, it tells you how much money you’re making (or losing) and where your investment funds are being spent. But for a document that’s so vital to gauging your success, a traditional profit & loss statement can be hard to update and difficult to read for anyone in your company who isn’t trained as an accountant. Enter Profit and Loss by Big Squid, a powerful application that transforms your profit-and-loss statement into an intuitive dashboard for measuring business performance and understanding why the numbers are shaking out the way they are. By uploading your data streams into the app, you can see metrics like operating margin and net income margin immediately—without having to add and subtract individual line items. And with its easy-to-use, dynamic graphing tools, Profit and Loss allows everyone from your CEO to your front-line workers to see how your company is trending in real time. 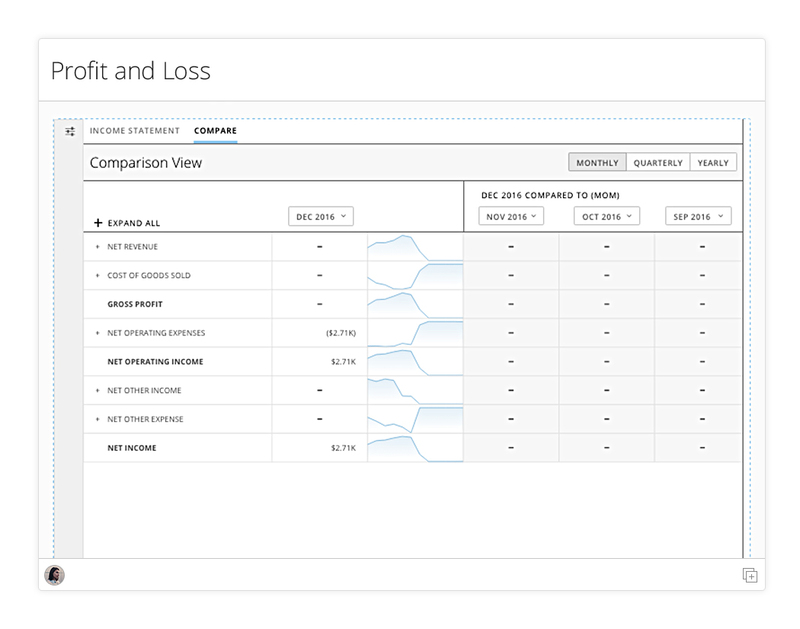 Get more out of your profit-and-loss statement with customizable data insights. What makes the Profit and Loss app so special is that it not only offers an up-to-the-minute, high-level overview of where your company stands, but it also gives you the ability to drill into individual items for greater detail. For instance, you could make dynamic graphs of specific operating expenses like hardware or vehicle maintenance to see how certain costs are rising and falling over time. By moving these insights from an inscrutable spreadsheet into a more visual format, Profit and Loss allows you to easily explain what you’ve learned to your company’s decision makers. As a result, your executives get a better understanding of the factors that are influencing the bottom line, allowing them to brainstorm ways to improve things in the future. 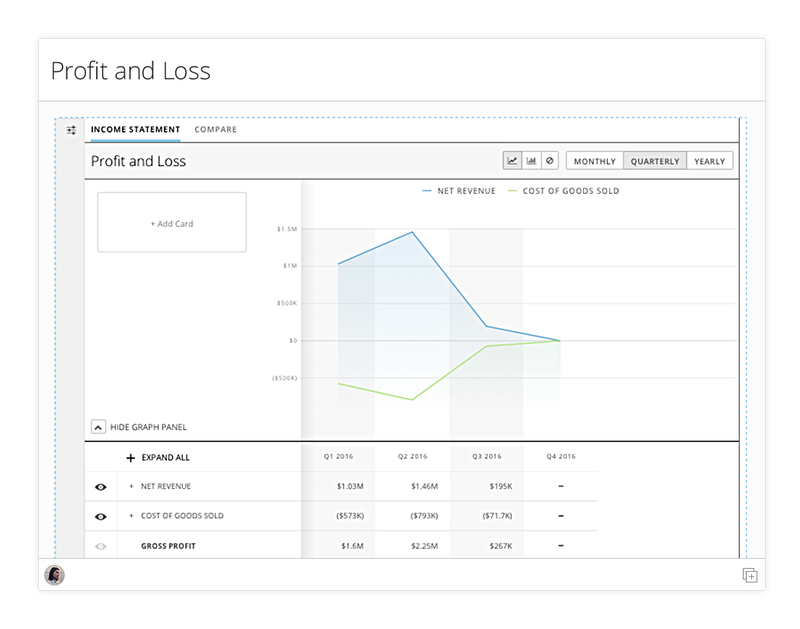 And of course, like most Domo Apps, Profit and Loss is highly customizable, giving you the flexibility to analyze your income statement with as much, or as little, granularity as you’d like.